Today, Friday, 29 April, is the feast day of one of the Church’s best loved saints, and Doctors, St Catherine of Siena. En-route into the Vatican Studios of Vatican Radio, to conduct the English language commentary of the Papal Mass from the Basilica of St John Lateran today, the Thirsd Sunday in Advent, during which the Holy Father opened the Holy Door of that Basilica; our own transitional parish deacon, Phil Andrews, studying at the Venerable English College in Rome, took these early-morning views of his walk from the College to Vatican City. 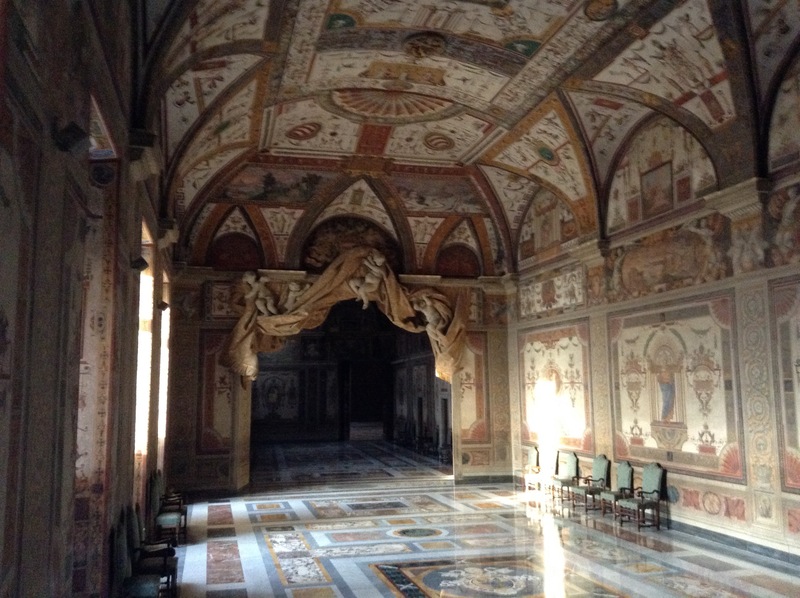 Many of these places are not open to the public for security reasons becasue of their proximity to the Apostolic Palace, and Secretariat of State. 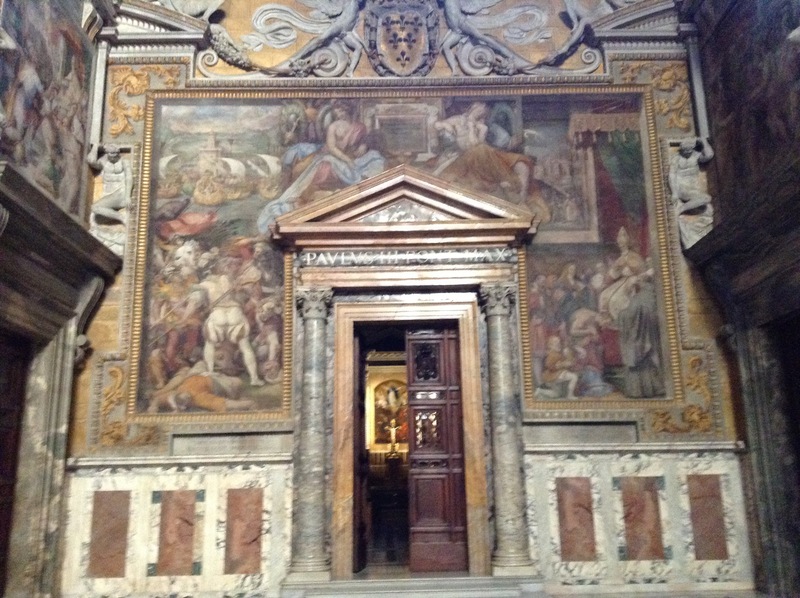 St John Lateran is the preeminent Church of the Christian world, being the Pope’s own Cathedral as Bishop of Rome, containing as it does his Cathedra, or seat, which is the sign of his teaching authority. Inscribed on the great facade of this building, originally built by the Emperor Constantine in AD324, are the words: Sacrosancta Lateranensis ecclesia omnium urbis et orbis ecclesiarum mater et caput (which in England are rendered: “The Most Holy Lateran Church, of all the churches in the City and the world, the mother and head”. It was this celebration today which inaugurated the opening of the Holy Doors in Cathedrals around the world, including that of our own Cathedral Church of St George in Southwark. Most of Deacon Phil’s current pastoral work in Rome is with Vatican Radio, part of which involves English language commentaries for Papal events, which are then carried by such media outlets as EWTN. 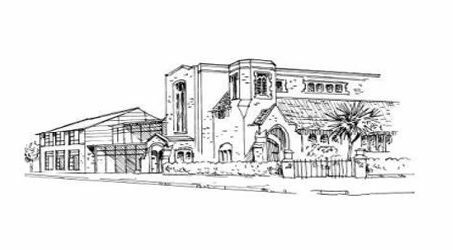 Deacon Phil, and his colleague at the VEC, Deacon David Howell from St Raphael’s in Surbiton are due to be ordained to the Priesthood in Southwark Cathedral this coming 16 July, alongside Daniel Weatherly from Tunbridge Wells. 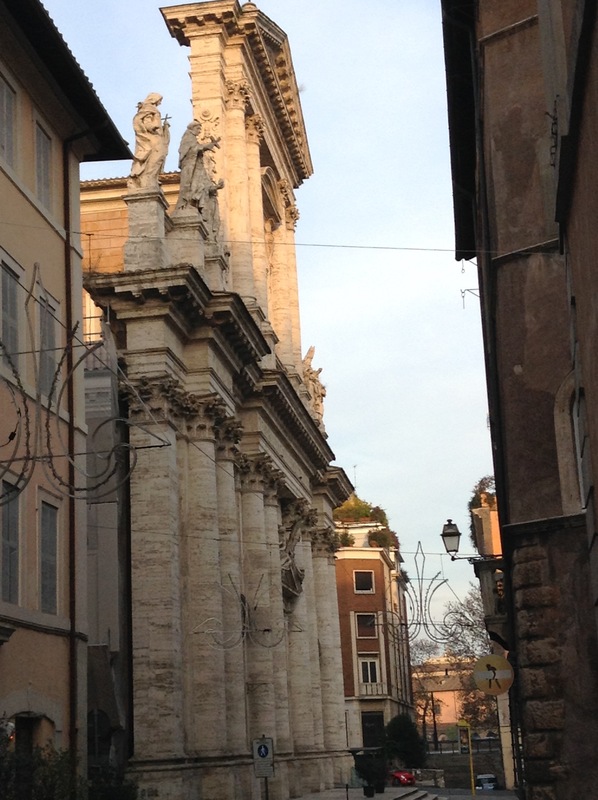 San Giovanni dei Fiorentini (This church, at the head of the via Giulia, has been designated the primary church for English-speaking pilgrims during the Jubilee of Mercy. During this year, Both Deacon Phil and Deacon David will officiate at Holy Hours and Devotions in Latin and English, for the English-speaking pilgrims in Rome. 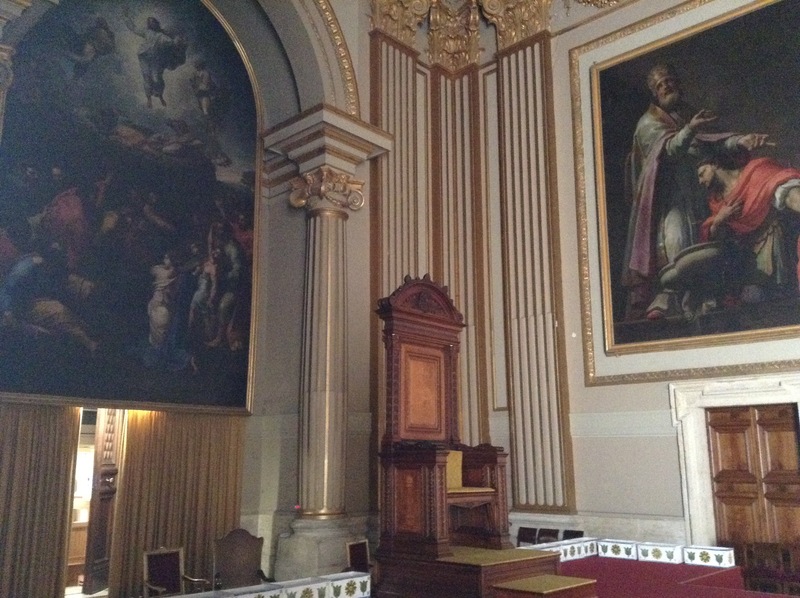 Holy Mass and the Sacrament of Reconciliation will also be available in English in this church. Note the humourous grafitti on the “No Entry” sign. The Romans invented grafitti over two thousand years ago. 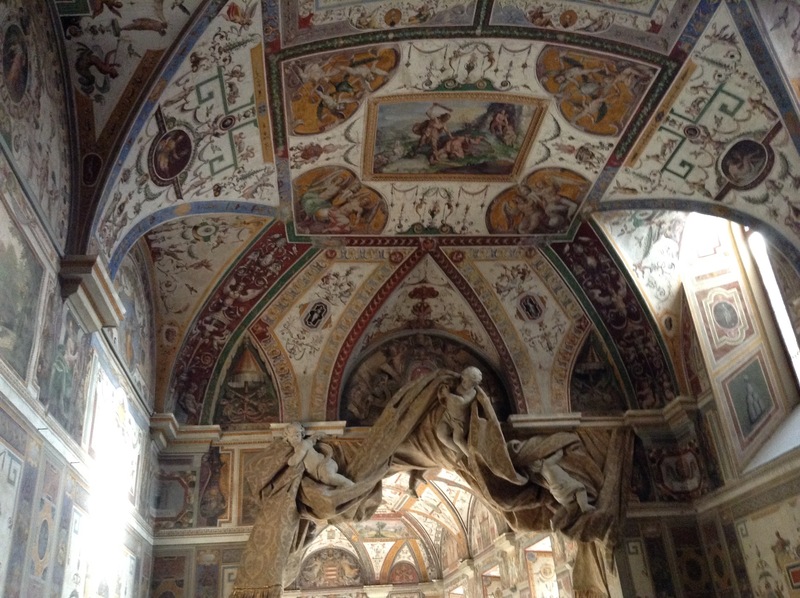 Without it, we may never have found St Peter’s tomb, which was identified by the presence of grafiti on a red wall enclosing his secret shrine! 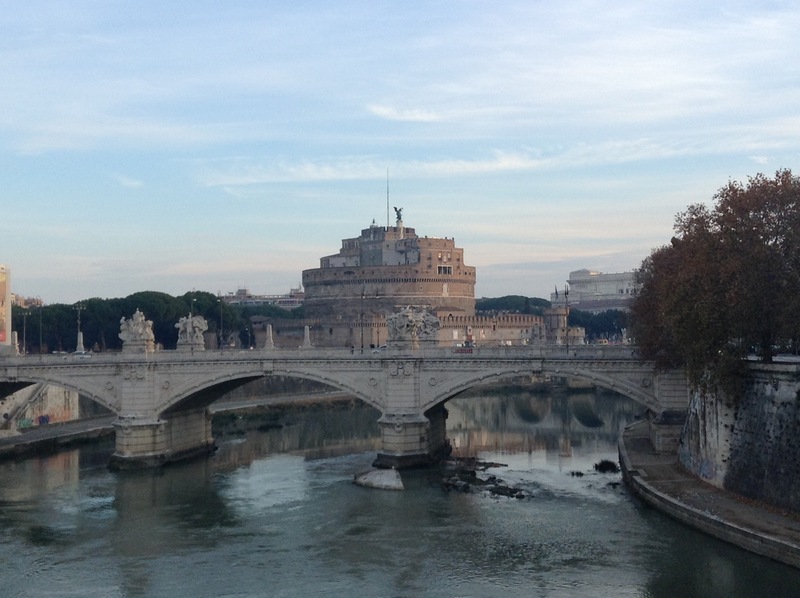 Looking across towards the Castel Sant’Angelo (originally the Mausoleum of the Emperor Hadrian, c.AD134), the ancient Ponte Sant’Angelo (also constructed in AD134 for the Emperor Hadrian, and which is now surmounted by beautiful angels, carved during the Renaissance, some by Bernini), and in the foreground, the Ponte Vittorio Emanuelle II, built in the C19 following the unification of Italy under the Crown of the Savoyards. 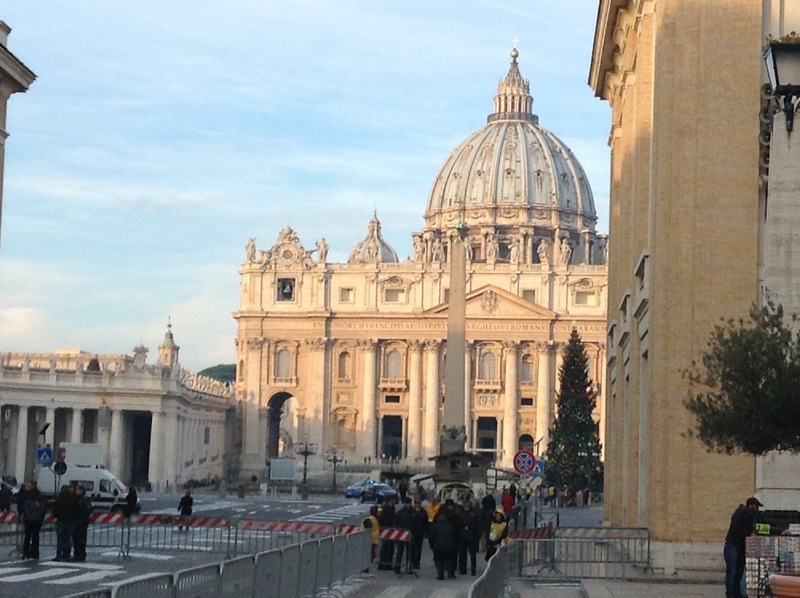 Two views of St Peter’s Square, showing the Crib and Christmas Tree. 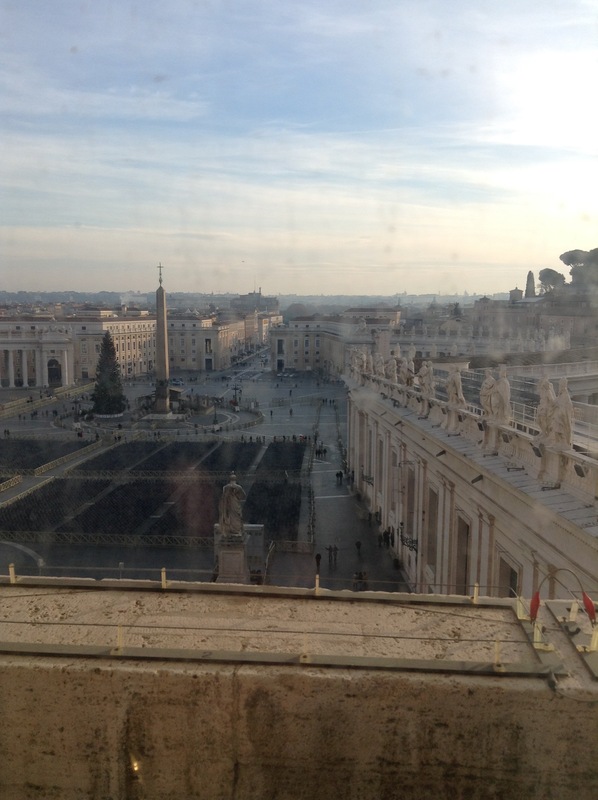 Note the heightened security around Vatican City. In recent days, The Holy Father, the Vaticam, and Rome itself have been explicitly theatened by ISIS in a number of terrifying videos showing the city’s destruction. This, however, has deterred neither the Holy Father, nor the citizens of Rome, from carrying on with their lives, in spite of the increased security everywhere. 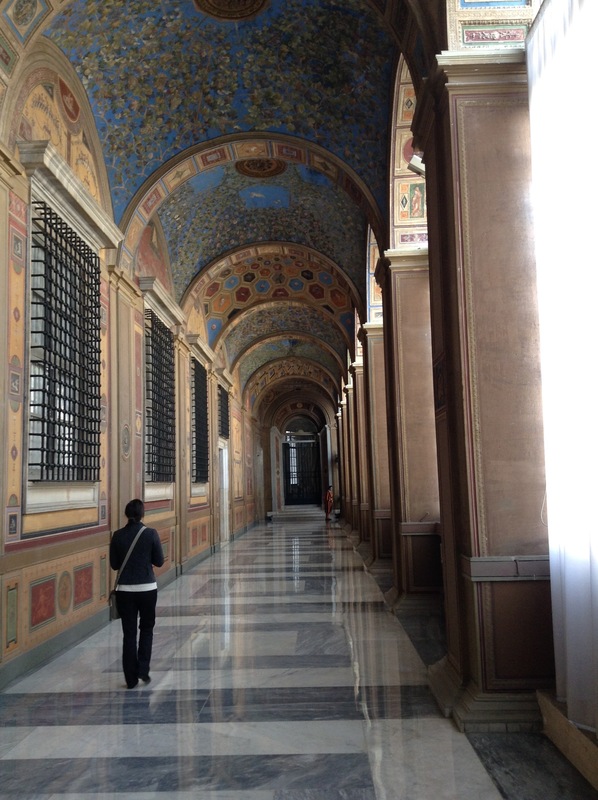 Porta Sant’Anna, the “Tradesman’s Entrance” to Vatican City, and used by all employees. 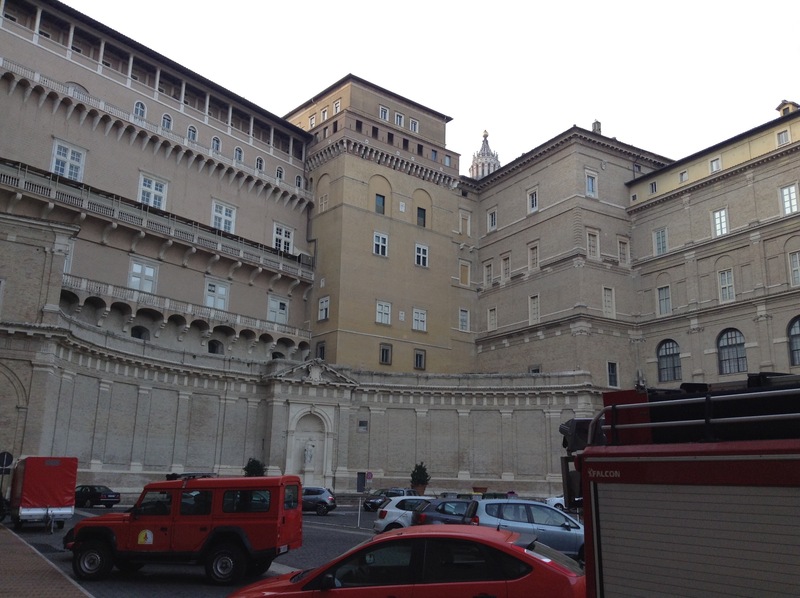 The Belvedere Courtyard, adjacent to the Apostolic Palace and Secretariat of State. 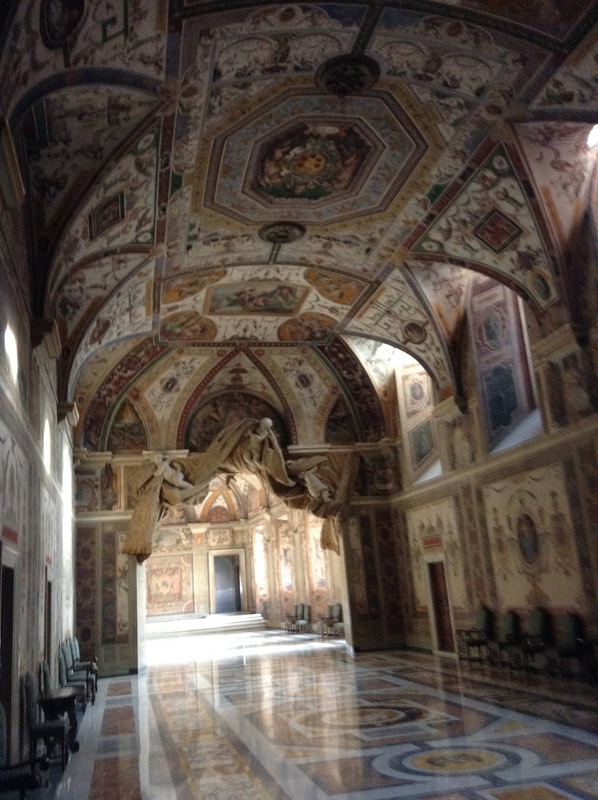 Note the top of the cupola of St Peter’s just above what is in effect the liturgical south wall of the Sistine Chapel. 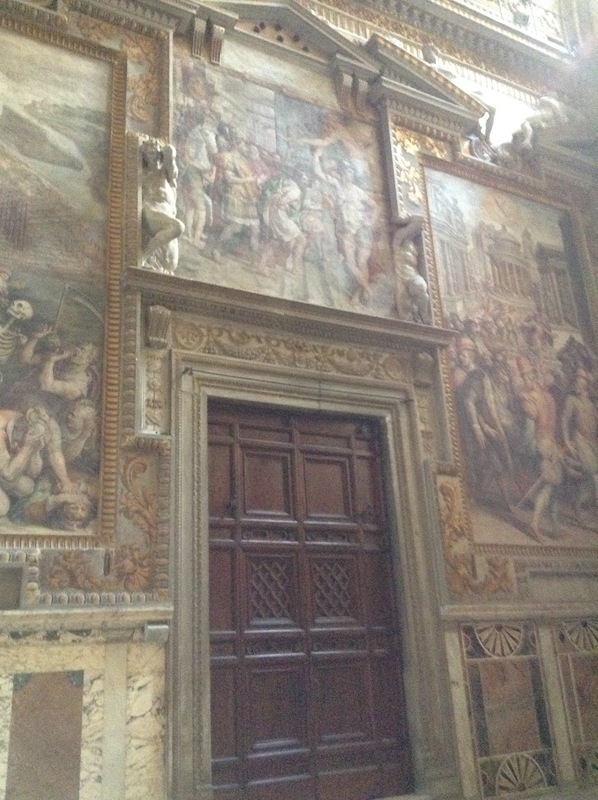 A view of the door into the Sistine Chapel from the Sala Regia. 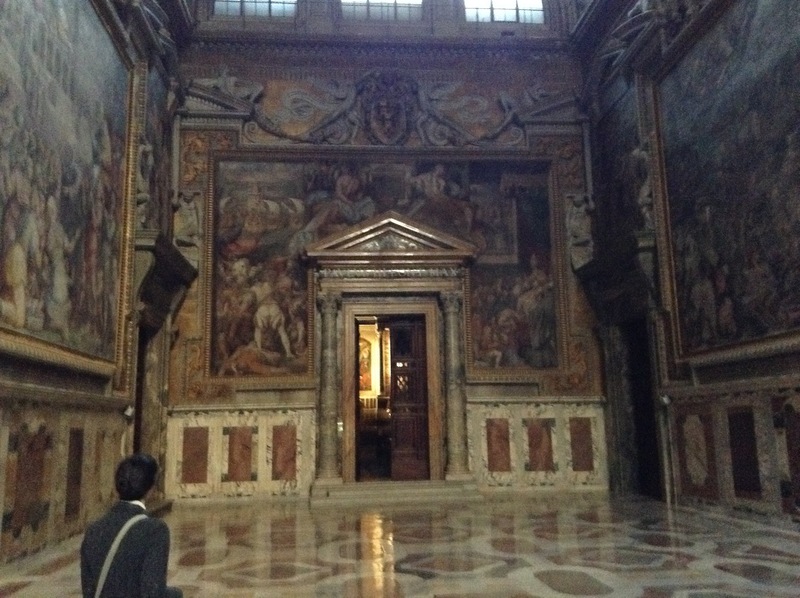 It is this door which is ceremonially sealed when the Cardinals are in Conclave. 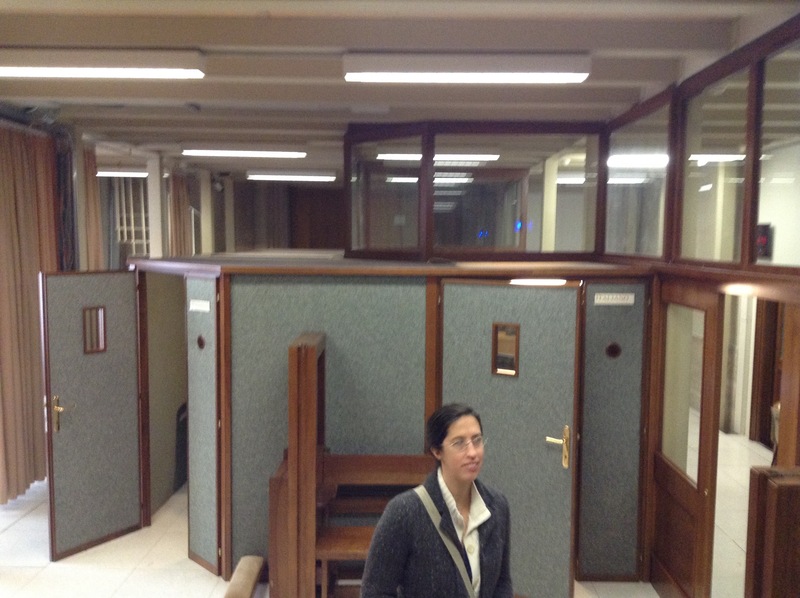 The modest sound booths, located behind the throne, and over the Arch of the Bells, of the facade of St Peter’s. 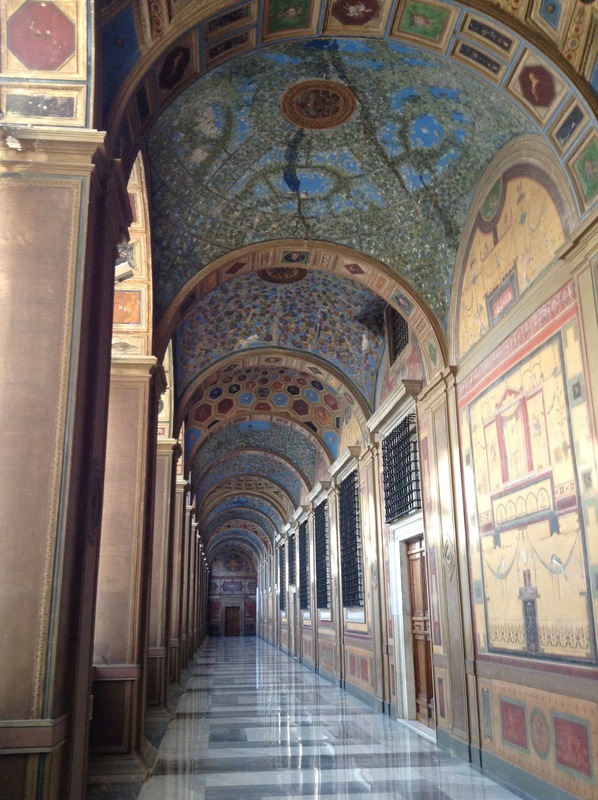 It is from here that all commentaries are given in the various languages, regardless of where the Holy Father himself may be. 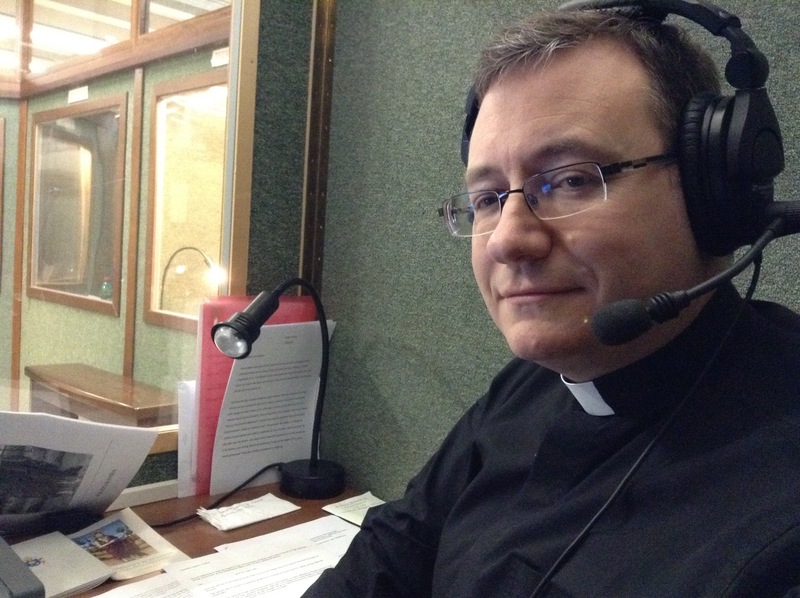 Deacon Phil Andrews working hard during a Papal Mass commentary! 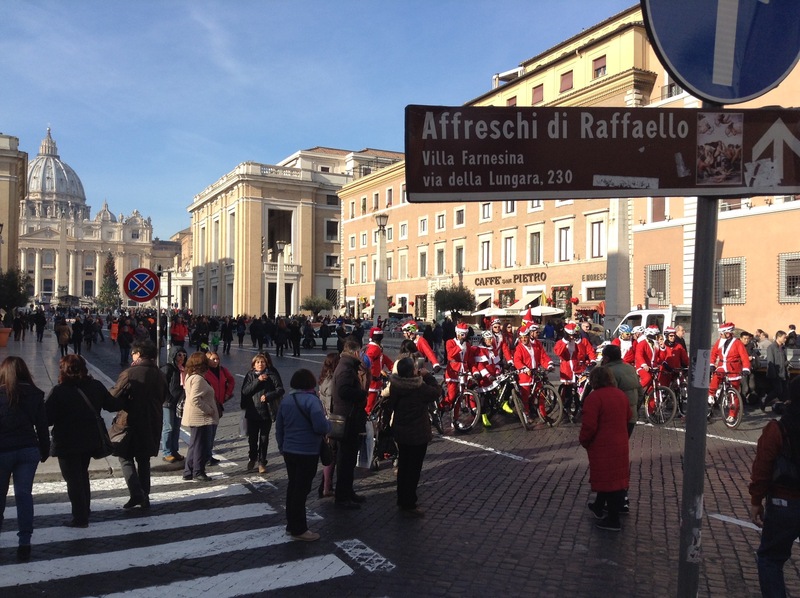 Santas waiting to undertake a charity bike ride in via della Conciliazione. 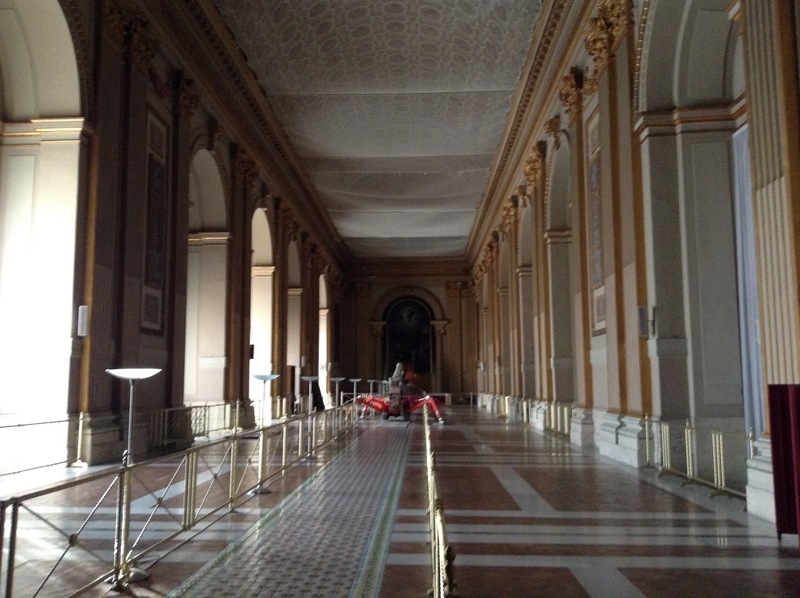 Note the everyday sign directing tourists to the priceless frescoes by Raphael in the Villa Farnesina. 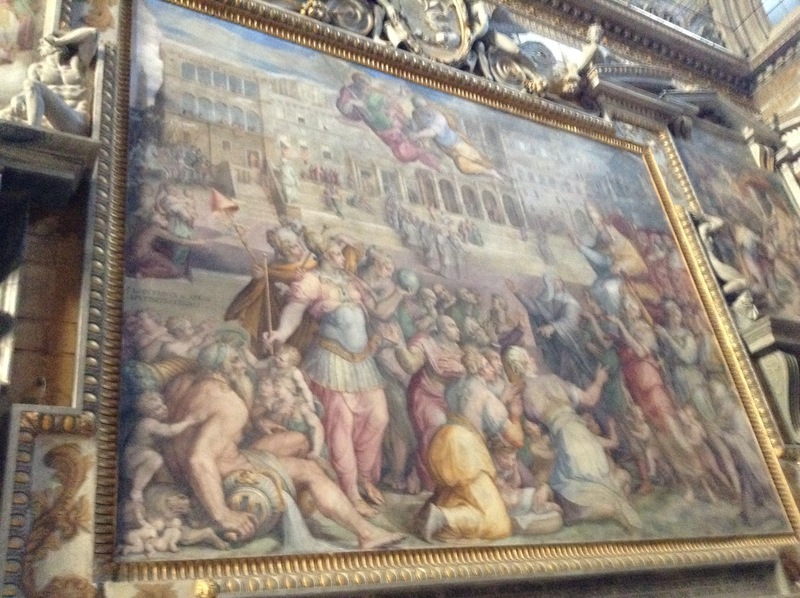 Of course, the Stanze delle Segnatura within the Vatican are really the place to see Raphael at his best, notably, the “Disputation of the Holy Sacrament”, and the “School of Athens”. Pope Francis, in Evangelii Gaudium, calls us to a special care for the poor. the local Food Bank; Street Pastors; our on-going ACN and other overseas projects, etc. Next week, I’m really looking forward to welcoming to Rome a number of friends from my home parish of New Malden. Flicking through the itinerary, it appears Felicity and Malcolm Surridge have prepared a real treat. Whether this is your first time in Rome, or you’re a seasoned visitor, there will be much to see, experience and, dare I say it, eat! Of course, the main reason why any Catholic comes to Rome is to make pilgrimage, specifically, “ad limina Apostolorum”, to the threshold of the Apostles, and to the Successor of Peter, Christ’s Vicar on earth. 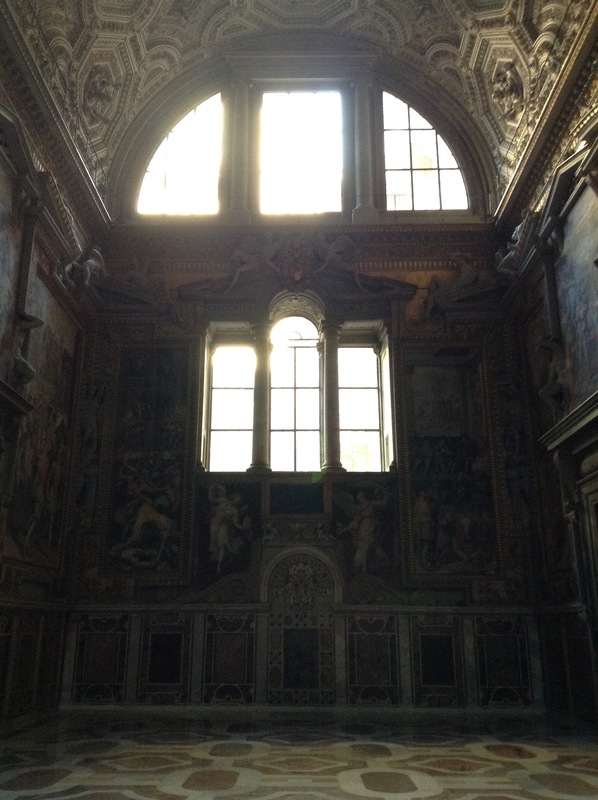 Whilst in Rome, you will, I hope, sense something of the holiness that permeates this city. 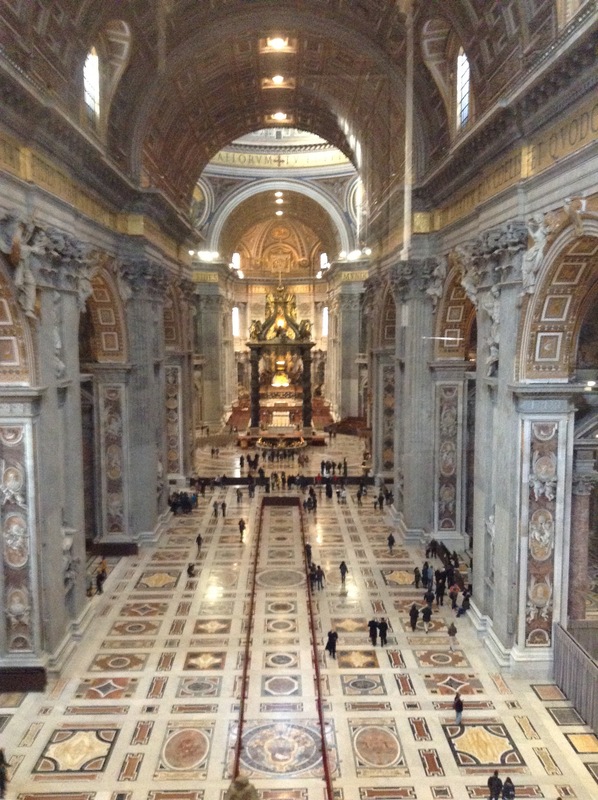 Of course, its a city of sinners, but also, one of saints… many, many saints: from the beggar saint, Joseph Labre, to the glorious Apostles themselves, Peter and Paul, whose mighty basilica shrines conceal the fact that they are also paupers’ graves. Buried within this city are many who witnessed, first hand, the Risen Christ; their fidelity to the Lord, even unto the cruel martyrdoms which many of them met, should give us great hope; and indeed, let’s not forget Rome’s present-day saints. As you enjoy walking around the narrow vincoli of the Centro Storico, or the wide boulevards of the Viminale, keep an eye open and you will witness many acts of saintly heroism, whether in caring for the poor, or in preaching the Gospel to an alienated world: two thousand years later, the faith of the Apostles is alive and well in this place, for this is the Church founded by Christ, upon the Rock, who is Peter. I look forward to seeing you all on Monday and assure you all of my love and prayers for a safe journey and a holy pilgrimage. 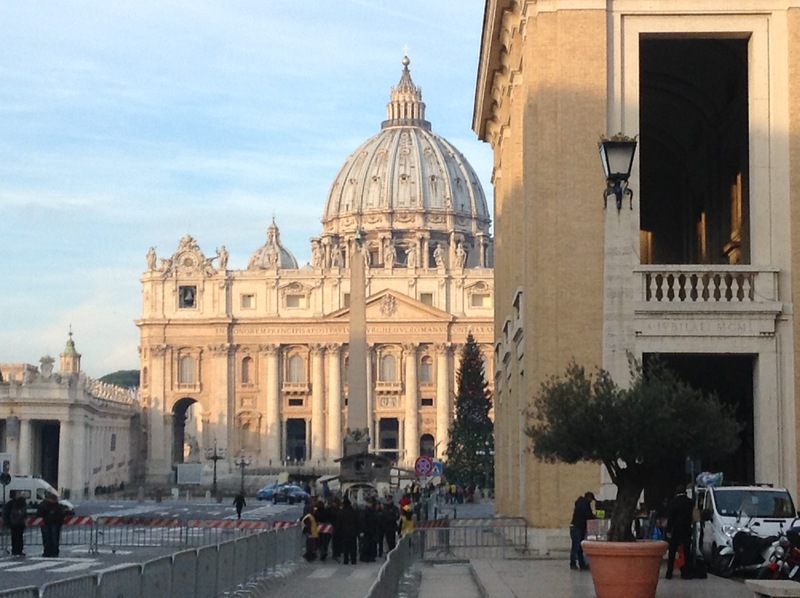 Family life will be the focus of an extraordinary general session of the Synod of Bishops that will meet at the Vatican between 5-19 October 2014. Around 150 Synod fathers will take part in the meeting to discuss the “pastoral challenges of the family in the context of evangelization.” It is expected to last two weeks. 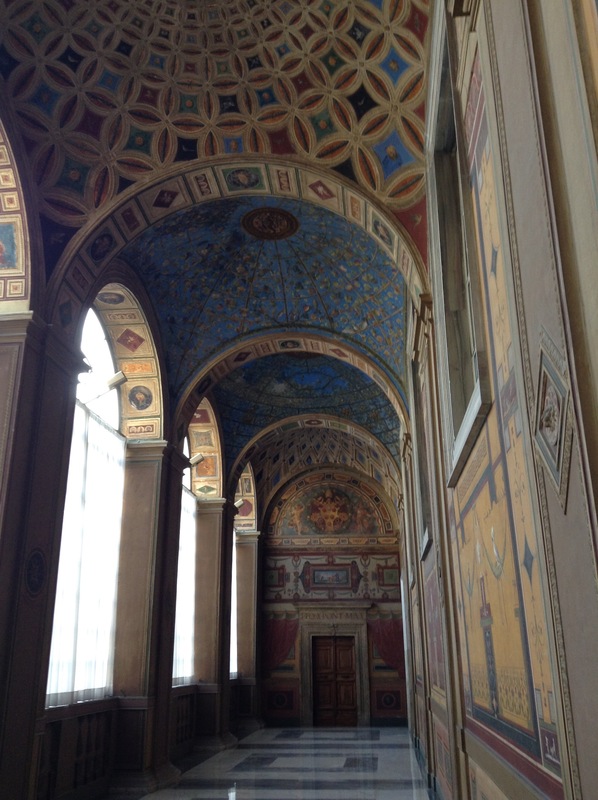 The English College is located only a short distance from the historic Jewish Quarter of Rome. It’s an area steeped in history, with many of its buildings incorporating vast swathes of ancient and medieval Rome in their structures. At the far end of “The Ghetto“, as it’s called, is the magnificent Teatro di Marcello, which is itself surrounded by other impressive sites of archeological and historical interest, such as the Campidoglio on one side and the Portico d’Ottavia on the other. Dominating the entire quarter is the great Synagogue, which dates from the late nineteenth-century, and replaces a much older structure. 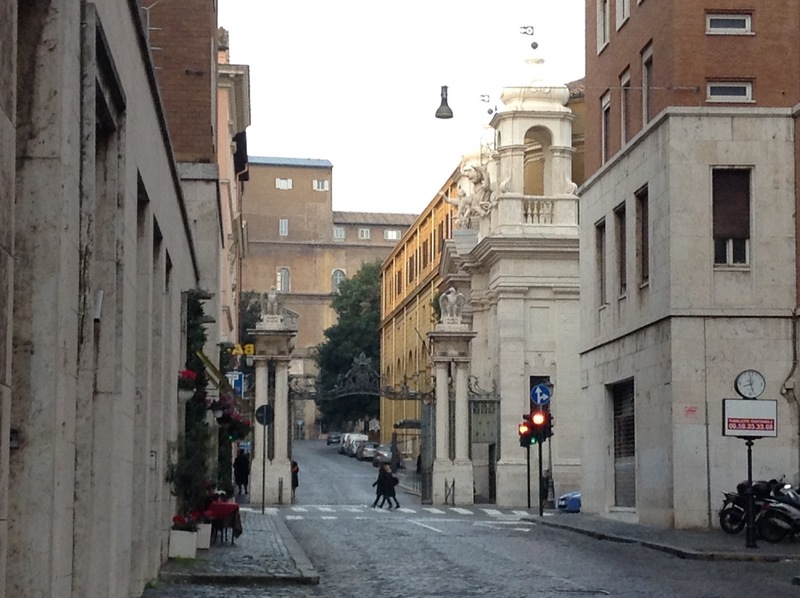 Nowadays, the area is popular with tourists who wish to try the very specific flavours of Roman kosher cooking, and in spite of the increase security bollards and police posts, it is a peaceful and beautiful part of Rome in which to enjoy an evening passeggiata, and maybe take an aperitivo. However, it was not always so, and yesterday, the People of Rome remembered one of the most terrifying events of the last century: the deportation of the Roman Jews. The Nazi occupying forces commenced their roundup of the Roman Jews on the 16 October, 1943. The “Raid of the Ghetto” started at 05.30 in the heart of the historic Jewish quarter near via Portico d’Ottavia, Arenula and the Teatro di Marcello. Simultaneously in the the rest of the city, which had been divided into 26 operational areas by the German Command, the “Hunt for Jews” progressed without mercy. The captured Jews were initially imprisoned at the Military College in via Lungara, awaiting transportation to concentration camps. 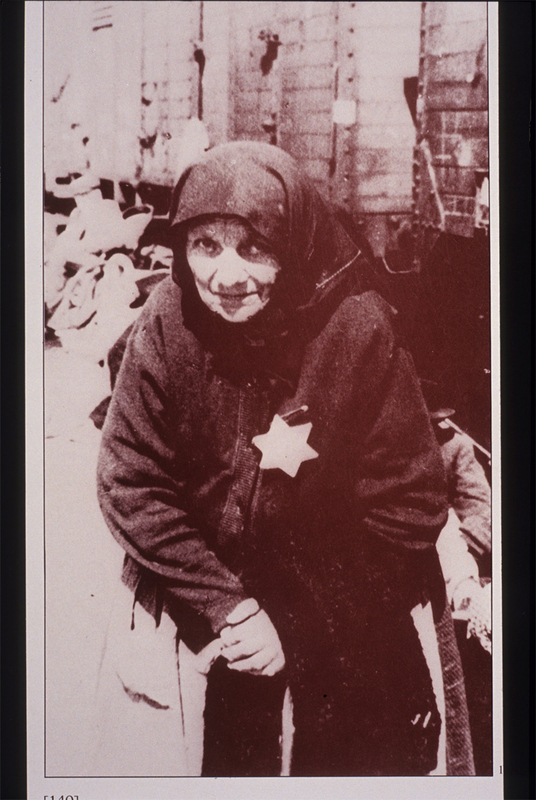 The first group of 1,023 men women and children, young and old, departed from Tiburtina station in sealed cattle wagons on 18 October, bound for Auschwitz – Birkenau. Amongst their number, 244 were children, the youngest being the son of Marcella Perugia, born the day before departure. 188 were senior citizens, born before 1884: the eldest, Rachel Livoli, was 90-years-old. Upon arrival at Birkenau, the majority were sent immediately to the gas chambers; only 149 men and 47 women avoided this immediate fate. At the end of the war, only one woman, Settimia Spizzichino, will have survived, along with 16 men. Upon hearing the news of the deportation, Pope Pius XII gave orders to priests, monks and nuns to do all that they could to shelter and protect the Jews from the Nazis. Many enclosed houses of female sisters, which had not seen a man within their walls for centuries, now provided much-needed sanctuary for hundreds at a time. The Bridgetine convent in Piazza Farnese, next to the English College, sheltered many Jewish families, breaking an enclosure which had existed prior to this event for 700 years. 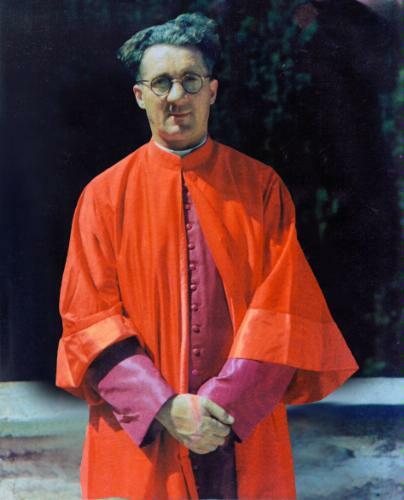 Perhaps the most famous of the these wartime heroes was Mgr Hugh O’Flaherty, who saved many Allied military airmen, as well as hundreds of Jews, by hiding them in convents. He was Public Enemy Number One as far as the SS were concerned. Nevertheless, he would go on to eventually convert the Nazi SS Lieutenant Colonel Herbert Kappler, in spite of the fact that Kappler had ordered numerous attempts to have the priest murdered during the Occupation. After the war, O’Flaherty was Kappler’s only visitor, visiting him every month. In 1959, Kappler was baptized into the Church, at the hands of the man he had tried so hard to kill. A film, The Scarlett and the Black, was made in 1983 staring Gregory Peck as the jovial Irish Monsignor, with Christopher Plummer as the SS officer who ultimately found friendship and salvation in the most unlikely of places. By the time of Rome’s liberation, another 1,000 Jews will have been deported. However, the number would have been much higher had it not been for the decisive action of Pope Pius XII and the valour of many Roman laity, priests and nuns, who acted on his call to save their fellow Romans. 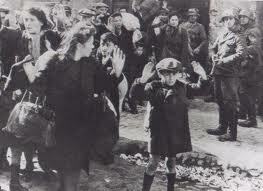 When I was a young lad growing up in the relative safety of the UK, when thinking of the atrocities of the Nazis, we used to say, “Never Again!”; yet, in spite of this harsh lesson from history, there are many places in our world – today – where entire populations are being wiped out. Thankfully, subsequent Popes, and others of goodwill, continue to speak out against these acts of barbarity, and at least some people hear them, and take a stand. On Sunday 13 October 2013, Pope Francis celebrated Solemn Mass in St Peter’s square in honour of the Marian Day, an event organized as part of the Year of Faith, on the anniversary of the final apparition of the Blessed Virgin Mary at Fatima (13 October 1917). As part of this celebration, he also consecrated the world to the Immaculate Heart of Mary. Here is the text of his homily, courtesy of news.va. In the Psalm we said: “Sing to the Lord a new song, for he has done marvellous things” (Ps 98:1). Today we consider one of the marvellous things which the Lord has done: Mary! A lowly and weak creature like ourselves, she was chosen to be the Mother of God, the Mother of her Creator. Considering Mary in the light of the readings we have just heard, I would like to reflect with you on three things: first, God surprises us, second, God asks us to be faithful, and third, God is our strength. First: God surprises us. The story of Naaman, the commander of the army of the king of Aram, is remarkable. In order to be healed of leprosy, he turns to the prophet of God, Elisha, who does not perform magic or demand anything unusual of him, but asks him simply to trust in God and to wash in the waters of the river. Not, however, in one of the great rivers of Damascus, but in the little stream of the Jordan. Naaman is left surprised, even taken aback. What kind of God is this who asks for something so simple? He wants to turn back, but then he goes ahead, he immerses himself in the Jordan and is immediately healed (cf. 2 Kg 5:1-4). There it is: God surprises us. It is precisely in poverty, in weakness and in humility that he reveals himself and grants us his love, which saves us, heals us and gives us strength. He asks us only to obey his word and to trust in him. This was the experience of the Virgin Mary. At the message of the angel, she does not hide her surprise. It is the astonishment of realizing that God, to become man, had chosen her, a simple maid of Nazareth. Not someone who lived in a palace amid power and riches, or one who had done extraordinary things, but simply someone who was open to God and put her trust in him, even without understanding everything: “Here I am, the servant of the Lord; let it be with me according to your word” (Lk 1:38). That was her answer. God constantly surprises us, he bursts our categories, he wreaks havoc with our plans. And he tells us: trust me, do not be afraid, let yourself be surprised, leave yourself behind and follow me! Today let us all ask ourselves whether we are afraid of what God might ask, or of what he does ask. Do I let myself be surprised by God, as Mary was, or do I remain caught up in my own safety zone: in forms of material, intellectual or ideological security, taking refuge in my own projects and plans? Do I truly let God into my life? How do I answer him? In the passage from Saint Paul which we have heard, the Apostle tells his disciple Timothy: remember Jesus Christ. If we persevere with him, we will also reign with him (cf. 2 Tim 2:8-13). This is the second thing: to remember Christ always – to be mindful of Jesus Christ – and thus to persevere in faith. God surprises us with his love, but he demands that we be faithful in following him. We can be unfaithful, but he cannot: he is “the faithful one” and he demands of us that same fidelity. Think of all the times when we were excited about something or other, some initiative, some task, but afterwards, at the first sign of difficulty, we threw in the towel. Sadly, this also happens in the case of fundamental decisions, such as marriage. It is the difficulty of remaining steadfast, faithful to decisions we have made and to commitments we have made. Often it is easy enough to say “yes”, but then we fail to repeat this “yes” each and every day. We fail to be faithful. Mary said her “yes” to God: a “yes” which threw her simple life in Nazareth into turmoil, and not only once. Any number of times she had to utter a heartfelt “yes” at moments of joy and sorrow, culminating in the “yes” she spoke at the foot of the Cross. Here today there are many mothers present; think of the full extent of Mary’s faithfulness to God: seeing her only Son hanging on the Cross. The faithful woman, still standing, utterly heartbroken, yet faithful and strong. And I ask myself: am I a Christian by fits and starts, or am I a Christian full-time? 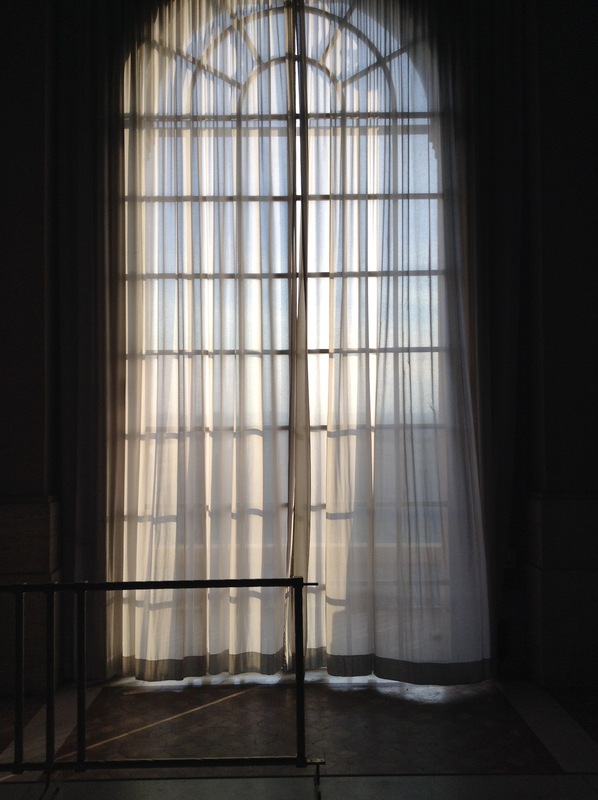 Our culture of the ephemeral, the relative, also takes its toll on the way we live our faith. God asks us to be faithful to him, daily, in our everyday life. He goes on to say that, even if we are sometimes unfaithful to him, he remains faithful. In his mercy, he never tires of stretching out his hand to lift us up, to encourage us to continue our journey, to come back and tell him of our weakness, so that he can grant us his strength. This is the real journey: to walk with the Lord always, even at moments of weakness, even in our sins. Never to prefer a makeshift path of our own. That kills us. Faith is ultimate fidelity, like that of Mary. The last thing: God is our strength. I think of the ten lepers in the Gospel who were healed by Jesus. They approach him and, keeping their distance, they call out: “Jesus, Master, have mercy on us!” (Lk 17:13). They are sick, they need love and strength, and they are looking for someone to heal them. Jesus responds by freeing them from their disease. Strikingly, however, only one of them comes back, praising God and thanking him in a loud voice. Jesus notes this: ten asked to be healed and only one returned to praise God in a loud voice and to acknowledge that he is our strength. Knowing how to give thanks, to give praise for everything that the Lord has done for us. Take Mary. After the Annunciation, her first act is one of charity towards her elderly kinswoman Elizabeth. Her first words are: “My soul magnifies the Lord”, in other words, a song of praise and thanksgiving to God not only for what he did for her, but for what he had done throughout the history of salvation. Everything is his gift. If we can realise that everything is God’s gift, how happy will our hearts be! Everything is his gift. He is our strength! Saying “thank you” is such an easy thing, and yet so hard! How often do we say “thank you” to one another in our families? These are essential words for our life in common. “Excuse me”, “sorry”, “thank you”. If families can say these three things, they will be fine. “Excuse me”, “sorry”, “thank you”. How often do we say “thank you” in our families? How often do we say “thank you” to those who help us, those close to us, those at our side throughout life? All too often we take everything for granted! This happens with God too. It is easy to approach the Lord to ask for something, but to go and thank him: “Well, I don’t need to”. As we continue our celebration of the Eucharist, let us invoke Mary’s intercession. May she help us to be open to God’s surprises, to be faithful to him each and every day, and to praise and thank him, for he is our strength. Amen. 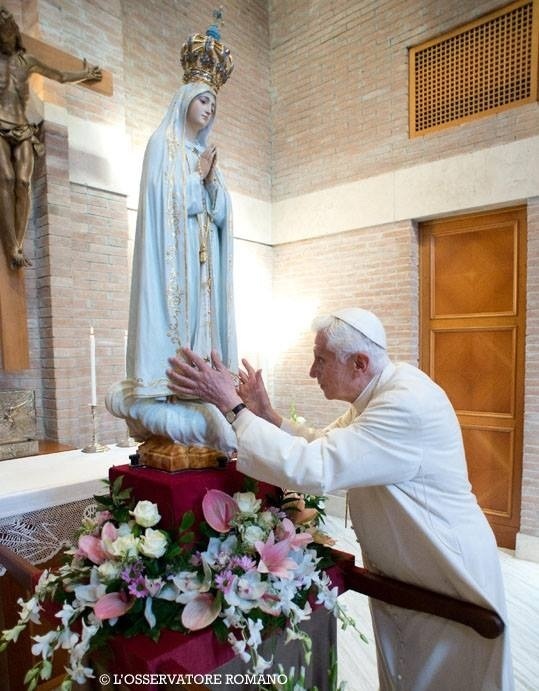 Pope Emeritus Benedict receiving the image of our Lady of Fatima at his private oratory.